n 1913, Henry Ford perfected the mass- production process with his re-designed Model T. Inspired by efficient Chicago meatpacking processes, Ford developed a sophisticated assembly-line method reducing production time from 12 1/2 to 2 1/2 hours, and the car price from $900 to $440. In 1913 alone, 168,000 were produced. His unprecedented system became known throughout the world as Fordism, and by 1915 had reduced skilled labor in auto factories from 60% to 13%. Fifteen million Model T's were produced and in 1960, designer Jay Doblin called it "the most beautiful car ever built, a classic illustration of what an automobile should be." When Henry Ford originally introduced the Model T in 1908, it was available at $845 in black only (similar cars cost $2,000 to $3,000). It was called a "flivver" and said to be "stronger than a horse and easier to maintain." In 1909, Henry Ford declared that he would build only this model in the future, and only in black. In 1910 Ford opened its new Highland Park plant, designed by architect Albert Kahn to produce Model T's. The plant design was architecturally expressive of manufacturing technology, and between 1922 and 1926 Kahn also designed a coke-oven plant, a foundry, a cement plant, an open-hearth steel plant and a new River Rouge site for Ford. 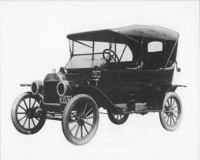 After 1913, sales of Model T's boomed. By 1917 they comprised forty-two percent of US annual car production; by 1918, fifty percent; and by 1923, 52 percent. In 1923 Alfred P. Sloan, Jr. (1875-1966) took the helm of General Motors. He introduced innovative new consumer strategies, including consumer credit and the annual model change. By 1926, Chevrolet challenged Ford with bold new styling and colors, forcing a change in the Model T. Henry announced his new cars would now be offered in "deep channel green" and "rich Windsor maroon," as well as black. By 1927, GM captured 45% of the US market and Ford's share had dropped to 15%. That year, the last Model T was built and its new Model A was introduced.